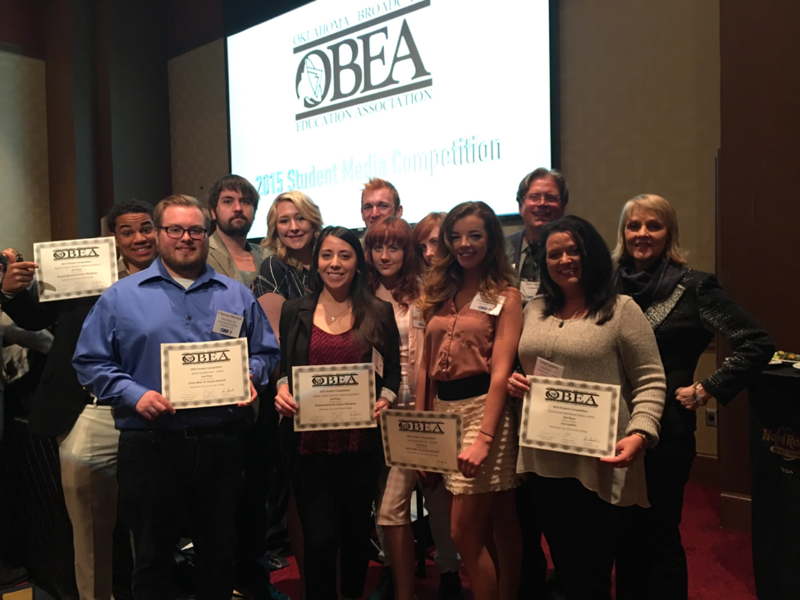 OCCC Broadcast students stand with their awards during the annual OBEA Student Day in Tulsa. Front row from left: Clayton Mitchell, Victoria Harrell, Emily Mitchell, Lisa Lasater. Back row from left: Carlton Thompson, Sean Giles, Brooke Altstatt, Grace Babb, Hunter Foster, Sophia Babb, Rick Allen Lippert, Gwin Faulconer-Lippert. Broadcasting students brought home five awards after attending the annual Oklahoma Broadcast Educators Association Student Day in Tulsa on March 21. Grace Babb won first place for her entertainment short. Victoria Harrell and Carlton Thompson placed second for a radio public service announcement. Lisa Lasater placed second for her television informational video. Emily Miller and Clayton Mitchell placed second for an entertainment short. Jorge Krzyzaniak placed third for his entertainment short. Professor Gwin Faulconer-Lippert said the contest is designed to boost broadcasting students in their professional development. Faulconer-Lippert has been teaching at OCCC for 28 years. She said she has been a member of OBEA since she began teaching. She described the singularity of Student Day, telling of its purpose. She described the day as a motivational event. The students who attended concluded that having the right connections can help you get where you need go. They took advantage of the opportunity to make those connections at the event. Every year, broadcasting students from colleges and universities across Oklahoma participate in a job fair, giving students the opportunity to meet future employers. Broadcasting major Hunter Foster described the day as incredibly useful for networking. The job fair provided opportunities to meet radio hosts, executive producers, and representatives from local news stations. Supplemental instructor and audio lab assistant Sean Giles has learned the ropes of the conference. This was his third year in attendance. “If you don’t talk to anyone, you can’t expect to get anything out of the job fair,” Giles said. He spent his time speaking with producers and radio representatives throughout the day. Emily Miller, public relations major and OBEA competition winner, concurred. Miller described how OCCC has helped make networking easier, providing creative opportunities to students and the tools needed to compete with other schools. “We’re very lucky to have the best professors for what we do. The heads of our departments really care and know how to file for grants for the equipment we need.